by Shannon Clark in Giving Birth Naturally | 2 comments | Contains affiliate links. When I first told my husband I was thinking about a home birth, he got on board really quickly. He’s just awesome like that. Trying to explain my desire for a home birth to family was more of a challenge. Unfortunately, one of the things preventing a lot of women from choosing home birth is the perceived lack of support from their families. 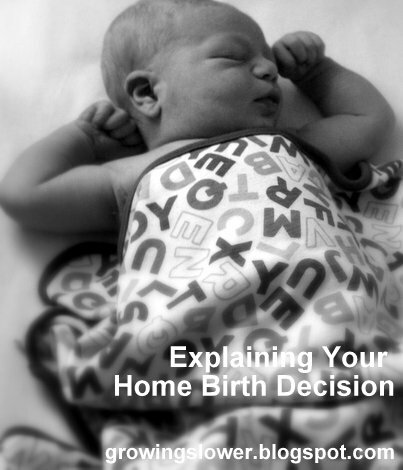 After having gone through the process of explaining our decision to have a home birth, I wanted to share a few tips to help the discussion go a little smoother. If you’ve decided to have a home birth, chances are you’ve already done a considerable amount of research. When you’re going into a discussion with family, have your research at your fingertips. Most people immediately reject the idea of home birth based on fear of the unknown. Only a small percentage of women in the US give birth outside of the hospital, so alternatives are very unfamiliar to most people. You can help ease your family’s fears by providing accurate information and statistics about the safety of home birth. 2 Let them ask questions. While my family is learning to roll their eyes and ignore getting used to all of my unconventional ideas by now, they were very skeptical and negative about the idea of a home birth at first. My first instinct was to vehemently defend my decision. However, the best thing we did was to simply allow them to ask questions and voice their fears while I tried not get too worked up. There are a LOT of misconceptions about the safety of home births and birth in general in our culture. As you talk about your decision, try to remember your family is only concerned for the safety of their you and your new baby. While discussing our home birth decision with family, we had all of our research material available to answer questions. If we didn’t know the answer, then we went to our midwife and she patiently answered them for us. She even offered to communicate with my family directly if need be. In the end it was a great exercise because we learned a lot of information that we never would have thought to ask about. 4 Remember it’s your decision. If possible it is ideal not to have any emotional issues or negativity going into birth. My midwife told me again and again to make sure to have everything worked out before hand, so it did not hinder labor. Even after talking and listening to family though, they may not agree with your home birth decision. It’s hard not to have peace among family members, but ultimately it is your and your husband’s choice. You’re really just paying extended family a courtesy to discuss it and let them know the facts. In fact, you are the parents now. It is your responsibility to make the best possible decisions for your family, and this is great practice even before baby arrives. Want to Save on Groceries? Join over 21,274 Affording Motherhood moms and get my free guide How to Save $100 on Groceries in Under a Minute. Super hints for those who are considering home birth. I think you hit the nail on the head when you said family is just concerned for your safety. Educating them will definitely help! Thanks so much for posting this. I’m gonna send it to a friend who is doing a non-traditional birth & I think these are such great tips. I believe you can be a stay at home mom without constantly stressing about money. Let me help you thrive financially – so you can spend more time with your family. Ready to Save Big on Groceries? Join over 21,274 moms of Affording Motherhood and get your free grocery savings guide: How to Save $100 on Groceries in Under a Minute. Copyright Shannon Clark, 2011-2019. All rights reserved. Please do not copy or distribute any part of this site. Free Download: How to Save $100 on Groceries in Under a Minute .